The North Carolina AHEC Program evolved from national and state concerns with the supply, distribution, retention and quality of health professionals. WORK SESSION – the staff of the UNC Medical School’s Division of Education and Research in Community Care wrote a proposal that brought the $8.5 million contract to the university. Here, in a work session, they listen to Glenn Wilson, then project director, talk about the need for better distribution of health manpower across the state. From left, around the table, are: John Payne, Shirley Jacobs, Faye Pickard, Ann Francis, Jim Vaughn, John Parker, Dr. Glenn Pickard, Moses Carey, Sally Powell, Dr. Eugene Mayer, Vince Kavel, Ethridge Price, Dr. W. Reece Berryhill, and Glenn Wilson. Reprinted from The Chapel Hill News, Volume 50, Number 94, Friday, October 6, 1972. In 1970, a report from the Carnegie Commission recommended the development of a nationwide system of Area Health Education Centers. Legislation and federal support since the early 1970s has made the implementation of AHEC programs possible in many states. This national focus coincided with a growing effort in North Carolina to establish statewide community training for health professionals and reverse a trend toward shortages and uneven distribution of primary care physicians in the state’s rural areas. The program began in 1972 with three AHEC regions under a federal AHEC contract with the University of North Carolina at Chapel Hill School of Medicine. 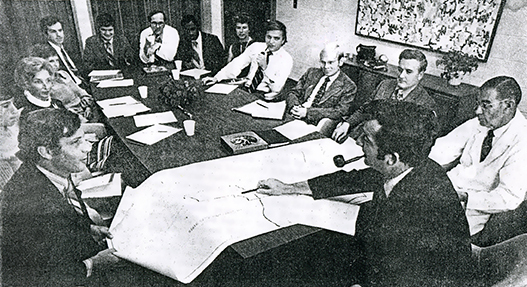 In 1974, the North Carolina General Assembly approved and funded a plan to create a statewide network of nine AHEC regions. The plan called for the establishment of 300 new primary care medical residencies and the regular rotation of students to off-campus sites. The General Assembly also provided funds to build or renovate AHEC educational facilities in the nine regions and to develop the proposed program components. By 1975, all nine AHECs were operational.